Arrive at Yangon International Airport. Welcome by our guide & transfer to the hotel. Then Start your sightseeing with drive through the Colonial Style Buildings downtown. Then visit Sule Pagoda situated in the center of Yangon, which makes a useful landmark in downtown, then visit to Botathaung Pagoda close to the Yangon Wharves. Evening, enjoy sunset at Shwedagon Pagoda, the ‘heart’ of Buddhist Myanmar. The Pagoda is believed to be 2,500 years old and there are always full with many people praying and making offerings at Shwedagon and especially on Full Mon days and religious days. Transfer to airport for flight to Kyaing Tong. Arrive at Kyaing Tong airport and transferred to hotel. Tour highlights include visit to U Mulein Da’s Shan Lacquerware Works, Wan Pon “Shan” Village and Shan houses, Wa people village and handy made powdered firearm. Breakfast at Hotel. Visit Yan-Law “Khun” people village, Palaung Village, Kat-Tauk village, Pin-Tauk “Lahu” village.Â Hiking to see “Akha people and rare “Ann” people. Afternoon visit Pin-Tauk Waterfall. Sightseeing around the Naung Tong Lake and take photograph with lake view. Breakfast at Hotel. Morning visit to Kyaing Tong Bazaar and meeting multi hill tribes. Hiking to Hokyin “Akha” people villages. Observing traditional Yan-gone Pottery Work. Visiting RCM Church, former times’ Italian Missionary. Visit Akha Centre Village and Weaving Works where traditional clothes are made before exporting to Thailand. Dancing “Lan Woan” in Loi-Lone village with full-dressed “Khunâe beautiful girls. Morning, breakfast at the hotel. Visit local market. Observe “Wat Zon Kham Temple”, which is very similar in architecture of Laungpraban in Laos, lacquerware workshop, pottery village, etc. Transfer to the airport for the flight to Heho. Upon arrival, drive to Inle and on the way, visit to Shwe Yan Pyae – Shan typical monastery. Then transfer to the hotel & leisure on your own. Boat excursion on the lake & visit to the local tribe market which held every 5 days in their correspondent village, Shwe Inn Dein pagoda complex. Continue visit to Phaungdaw Oo Pagoda the most venerable pagoda on the lake, Nga Phe Chaung monastery, floating garden & floating farm, etc. Morning visit around Inle Lake & visit to Inn Paw Khone village where you may observe the hand weaving of silk and lotus petal robe, cigar workshop at Nan Pan village. 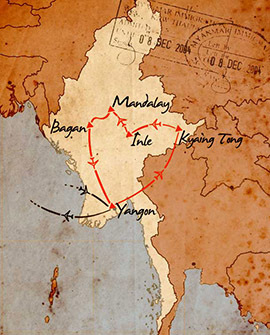 Then, transfer to the airport and flight to Mandalay. Upon arrival, transfer to the hotel. Boat excursion to Mingun (01 hour) along the Ayeyarwaddy River. During the river cruise, we may enjoy the fascinating landscapes of the river as well as the daily life of the people living along the Ayeyarwaddy. Visit Mingun pagoda – unfinished pagoda & the biggest ringing bell of 90 tons, the unusual Myatheindan pagoda. Back to Mandalay and visit traditional handicraft workshops such as, gold leaves beating, Kuthodaw Pagoda – the world biggest book, Shwenandaw (Golden Palace) Monastery. Finally enjoy the sunset on top of Mandalay Hill where we can admire the beauty of Mandalay City, Shan Plateau, etc. Come back to hotel and leisure. Early morning, transfer to the jetty for the river cruise to Bagan. Leisure and enjoy the marvelous landscapes during the cruise. The boat may stop in some villages to get the local passengers up and down. Arrive to Bagan and transfer to hotel. Overnight in Bagan. SHWE YEE PWINT HOTEL 3***. 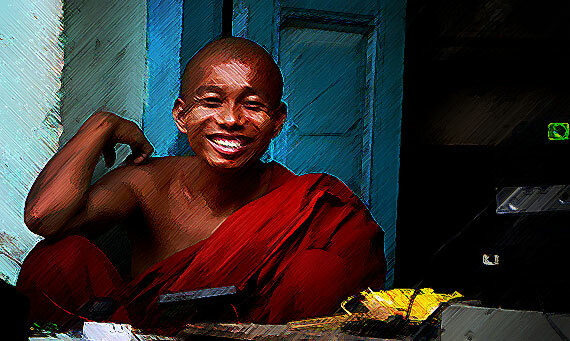 Visit colorful morning market, Shwezigon Pagoda – the golden stupa is the glory of Bagan, Gubyaukgyi Temple – the best mural paintings of 11th century, Htilominlo Temple – noted for its pilaster carving, Nathtaukkyaung Monastery – ancient wooden monastery, Ananda Temple – an architectural masterpiece resembling a Greek Cross, lacquer ware workshop – the unique of Bagan. After morning visit in Bagan, refreshment at the hotel. Late afternoon, visit Manuha Temple with gigantic Buddha images, Dhamayangyi Temple – the biggest temple in Bagan, Sulamani Temple – the 12th century temple, etc. Evening, you may enjoy the sunset from the top of the temple. Drive to Mt. Popa – an extinct volcano which is known as “Home of the Spirits” and observe the life of rural area and the cottage industry such as producing the palm sweets. We may stop at several places for making the photos and knowing the countryside. Climb up 777 steps to reach the top of Mt. Popa cliff temple and enjoy the landscapes, the panoramic view of extinct volcano and plain to Bagan. After visit, come down and back to Bagan. Visit Pwar Saw village to realize the ways of life of people. Finally, take the boat ride on mighty Ayeyarwaddy River during the sunset time. Transfer to the airport for the flight to Yangon. Upon arrival, transfer and check in at the hotel. Afternoon, visit Bogyoke market (close on Monday) and china town. Morning, breakfast at the hotel. Transfer to Yangon International Airport for the departure flight. – Government rates and other service charges. – Supplement for special meal requests. – Entrance fees and guide services during free time. – Travel insurance. We can put you in direct contact with our agent in Spain to report to you with no obligation.